Americare’s, the Stamford-based international charity that emphasizes quick relief efforts after natural disasters in the United States and worldwide, is providing relief in two areas recently hit by catastrophes of different types: an earthquake in Indonesia and the recent large fires in California. Aug. 7 — Americares is responding to the 6.9-magnitude earthquake that struck the Indonesian island of Lombok Sunday evening, toppling buildings, destroying roads and sending powerful aftershocks throughout the island. Indonesian officials are reporting more than 100 people have died, and more than 200 are injured. As many as 20,000 people are currently displaced and thousands more crowd outdoor areas as aftershocks continue throughout the region. Americares is deploying emergency response experts from the United States and Jakarta to assess survivors’ health needs and coordinate with partner organizations responding to the crisis. The health-focused relief and development organization stocks emergency medicine and relief supplies in its warehouses in the U.S., Europe and India that can be delivered quickly in times of crisis. This was the second deadly earthquake to hit Lombok in a little over a week. The first earthquake killed 20 and displaced more than 10,000 survivors. Located in the Pacific’s “Ring of Fire,” a chain of volcanoes and fault lines, Indonesia is particularly prone to seismic activity. In 2004, a 9.1-magnitude earthquake off the coast of Sumatra prompted a tsunami and led to more than 225,000 deaths. In the aftermath of the 2004 Southeast Asia tsunami, Americares completed a $50 million aid program that rebuilt schools, hospitals, water systems and livelihoods for survivors in Indonesia, Sri Lanka and India. In all, the organization built or renovated more than 40 health care facilities across Southeast Asia. Donations to Americares Worldwide Disaster Relief Fund will support its earthquake response in Indonesia. To donate, go to americares.org/worldwide. Aug. 1 — Americares is preparing an emergency shipment of relief supplies for families displaced by the catastrophic Carr Fire in California. The fire, which started more than a week ago, has claimed six lives and scorched over 112,000 acres, forcing tens of thousands of people to flee as homes and businesses burn to the ground. Americares is working with a local health center in Redding, Calif., to provide N95 respirator masks, hygiene kits and first aid supplies for survivors. Moving material in Americares’ warehouse. The charity’s headquarters and warehouse are on Hamilton Avenue, in Glenbrook, less than half a mile from Darien. According to the California Department of Forestry and Fire Protection the fire is 30 percent contained. It is one of the most destructive fires in the state’s history, destroying nearly 1,000 homes across Northern California. The Carr Fire is one of several uncontained wildfires raging in California as the state deals with brutal temperatures and dry conditions. 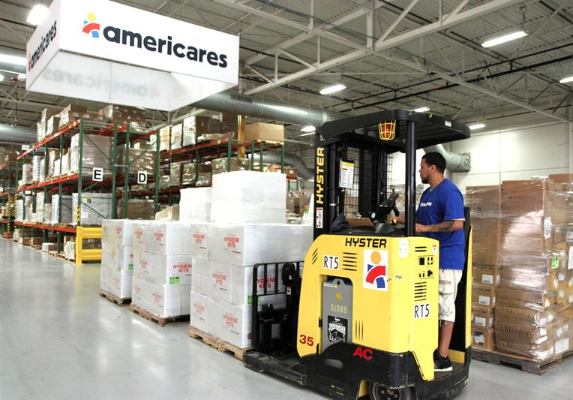 Americares has professional relief workers ready to respond to disasters at a moment’s notice and stocks emergency medicine and supplies in its warehouses in the U.S., Europe and India that can be delivered quickly in times of crisis. The organization has a long history of responding to emergencies in the U.S., including Hurricanes Sandy, Harvey, Irma and Maria, the Joplin tornado and the 2017 California wildfires. The health-focused relief and development organization responds to an average of 30 natural disasters and humanitarian crises worldwide each year, establishes long-term recovery projects and brings disaster preparedness programs to vulnerable communities. Donations to Americares U.S. Disaster Relief Fund will support its response to the Carr Fire. To donate, go to americares.org/usdisasterfund. Americares is a health-focused relief and development organization that saves lives and improves health for people affected by poverty or disaster. Each year, Americares reaches an average of 90 countries and all 50 U.S. states with life-changing health programs, medicine and medical supplies. Americares is the world’s leading nonprofit provider of donated medicine and medical supplies. For more information, visit americares.org. Americares of Stamford is mobilizing an emergency response expert following the deadly tsunami that slammed into the Indonesian islands of Java and Sumatra without warning Saturday night, killing at least 430 people and forcing 21,000 others from their homes. — an announcement from Americares According to officials, the tsunami was triggered by an eruption of the Anak Krakatau volcano that caused undersea landslides.